Description: This lovely sheath offers additional coverage to our Riley style. 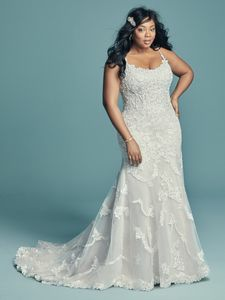 Beaded lace motifs dance over sequin tulle in this soft yet alluring wedding gown, completing the scoop back. Beaded spaghetti straps complete the elegant scoop neckline. Finished with covered buttons over zipper closure.